OK this is going to be a long one that includes pictures. Over the last 18 months or so, there has been a move towards a very different technique of AG brewing in Australia. It has its good points and it has its bad points, but its main feature is this. 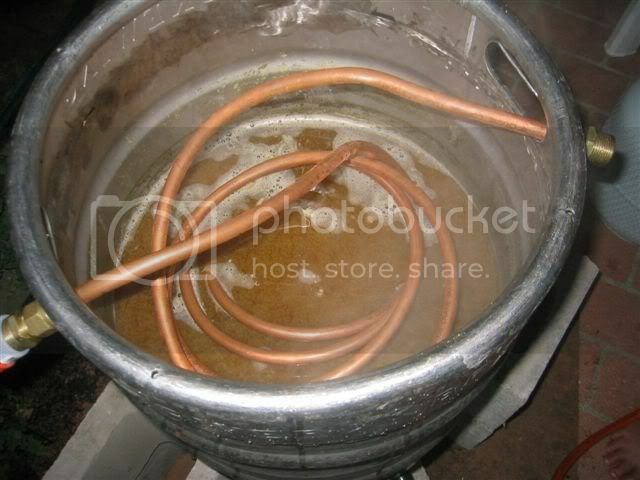 You can move from extract to AG brewing by purchasing/making 1 piece of extra equipment that costs less than $10.00 and takes up basically no room. It also cuts from 1.5-2.5 hours off your (normal AG) brew day and removes a couple of the things about AG brewing that intimidate extract brewers and make them reluctant to make the leap. These features are the whole purpose of this technique. Go AG with minimum extra cost , no extra equipment and use no extra space; And make it simple and attractive to new brewers. At the end of this post I will be posting a couple of links to relevant threads and Wiki articles on the Aussie Homebrewer forum, where this technique was cooperatively developed and refined. There you will find all the tech arguments and bickering that accompanied its birth. But its a bit of a read so I will try to summarise here. OK. onto the substance. 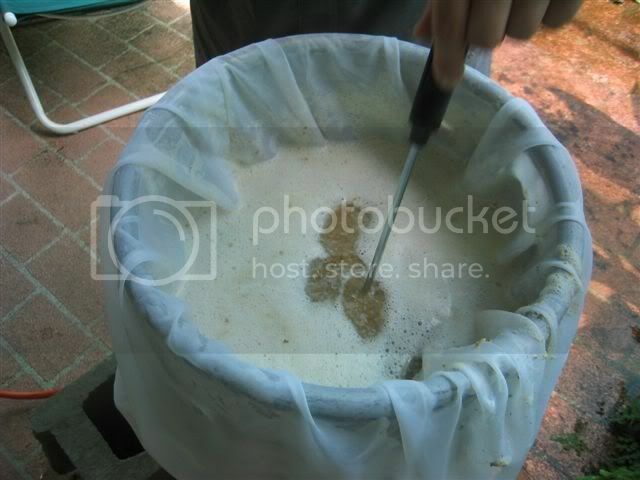 Introducing - Brew in a Bag Full mash volume, No sparge mashing. Instead of trying to describe everything in lengthy detail, I will do this as a brewday pictorial with explanations. 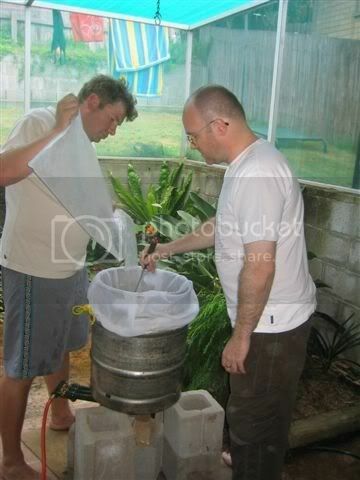 On New Years Day I taught a friend to brew. This was his first AG batch and my first full size batch of Brew in a Bag (BIAB). The recipe was a modified version of Denny's Rye IPA. 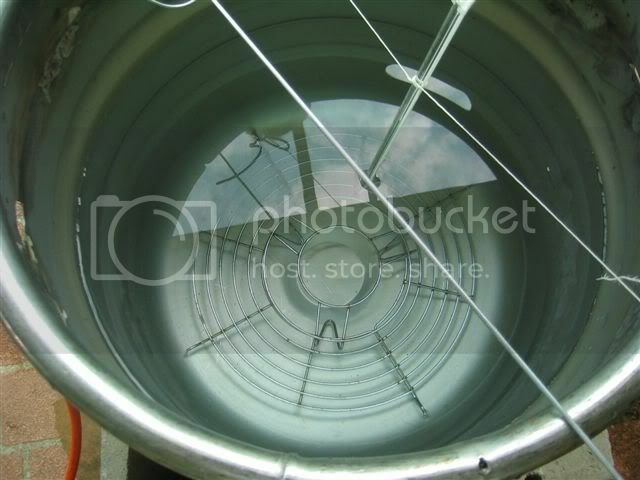 Inside the kettle you need to have some sort of a cake rack/false bottom/ wire thingy. This one is made from bits of Wok warming rack. You'll see why we need this soon. 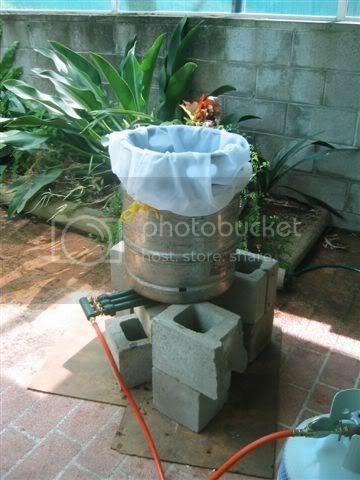 Right, now that the bag is in the kettle, its time to put in your strike water. And here is the bit where its gonna get controversial. Your strike/dough in water, is every last drop of water that you will put in the whole batch. Its all the water that would normally go in at strike, all the water for any infusions and all that water that would normally be used to sparge. ALL of it. As an example. in this batch we were looking for a pre-boil volume of 27.3 litres (7.2 gallons) and were using 6.45kg (14.2lb) of grain. So accounting for absorption by the grain, our total water needed was 35litres (9.25gal) and thats how much we mashed in with. The Full Volume. Right, so you heat your strike water up to the desired temperature, I just plug the water and grain volumes into promash to work out the temp, but with the sheer amount of thermal mass in the water volume, you only need to be a couple of degrees C higher than your desired mash temperature. In the BIAB brews I have done, I have always hit my strike temp within 0.5 degrees C using promash's figures. In this case I was shooting for 66 C and got 66.5. This is why you need the cake rack jigger in the bottom. It makes sure that the bag doesn't touch the bits of the kettle that are being directly heated. No melting. If you are using a high pressure turkey burner thing. You will need to be a bit careful about this. Then you dough in. Standard stuff, watch out for dough balls and stir the mash up thoroughly without aerating it. Its easy to get it well stirred because you have such a thin mash. By now your bag should essentially just be stuck to the walls of the kettle and/or sort of mixed in with the mash. After you stir it well and let it settle a bit, take your temp and adjust with direct heat if needed. But its a big volume and changes temp pretty slowly, and you have to stir. 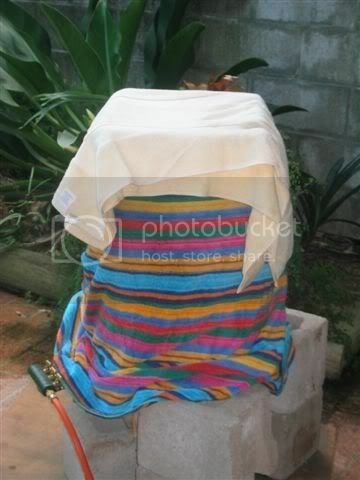 Put a lid on your kettle (which is at the moment your mash tun) and wrap it up in towels or blankets or something to insulate. Leave it for a good hour. Don't skimp on the mashing time, its important in BIAB. If anything, give it a bit longer. You can monitor the temp and add direct heat if you are really keen, but our temp only dropped by 2 degrees c in a 70min mash. You have a lot of thermal mass in there remember!! After you get to Mash Out temp. Its time to lauter. Here is the other controversial bit. There is No Sparge step. You more or less grab the bag and pull it out. 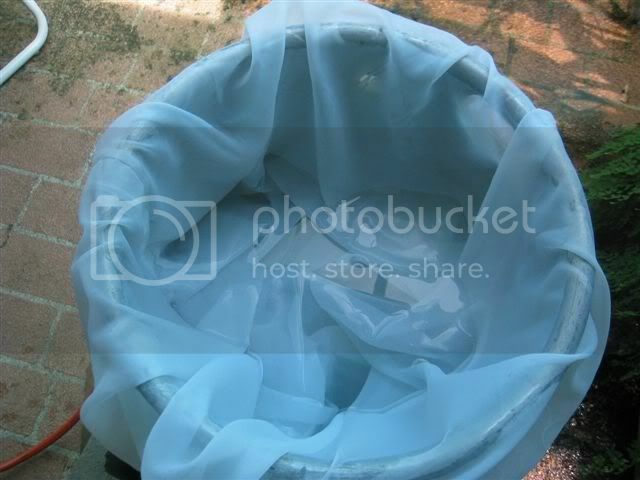 The material is fine enough to act as a filter, so there is no need for recirculation. There are no stuck mashes, no worries with tannin extraction and it takes 30 seconds to do. As you can see, we hung the bag up over the kettle to drip out. (kept the last half inch in contact with the wort to avoid splashing and HSA) but you could just toss it in a bucket if you don't have a handy sky hook. Give it a good spin and a squeeze. You will lose significantly less wort to grain absorption with BIAB. I work on only 0.5-0.75 litres/kg lost, compared with 1.1 litre/kg for traditional mashes. Heat goes on for the boil NOW. OK, once the bag has drained out completely. Toss the bag for later emptying and cleaning. You clean it by hosing it off well and then tossing it in the washing machine with the next load of clothes. Just rinse it well before next use. From here on in its as per normal for AG or Extract brewers. Boil, cool, aerate and ferment as you normally would. If you really want to be radical and save yourself a bunch of time and effort to boot. You could combine BIAB with the No-Chilling method I describe in this thread. Then your AG brewday would be about the same length as an extract brewday. But... that might be going a bit far for now, it works well, but it is a whole other mess of controversy. Here is our batch just before chiller goes on. Nice hot break! 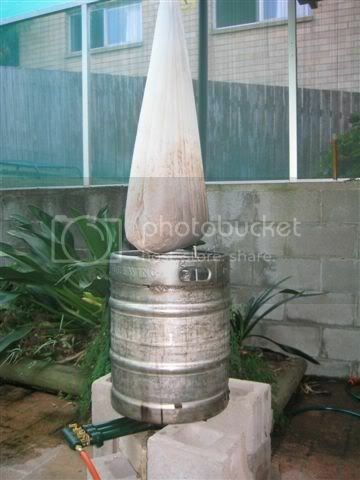 Lots of homebrewers in Australia are doing AG like this. Knowledgeable and experienced brewers are failing to find flaws in the beers produced this way and I believe that the method might well have produced its first award wining beer in the last couple of months. BUT, even though it actually does work plenty of people find they have an irresistible need to point out why it wont work. Or at least wont work very well. There are 2 main reasons why people think its a bad idea. Here's why they aren't really a problem. 1 - I can and have gone into lengthy discussions about L:G ratios. Mainly, people seem to be concerned about Beta Amalayse enzymes becoming denatured too quickly at such a high L:G ratio; and leaving you with an overly dextrinous wort. 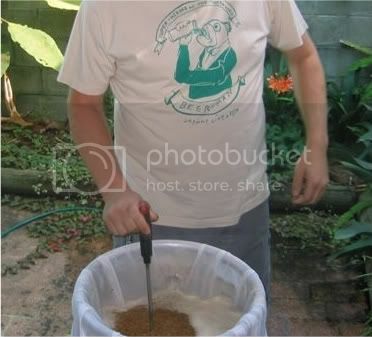 Then again, others say that a thin mash leads to increased fermentability, and therefore BIAB worts will be overly dry. In a way, they are both right. Both these things are a concern. BUT, in practise, they seem to balance themselves out; and worts well within the normal range are produced. Even at the L:G ratios involved with BIAB, still by far the biggest influence on wort fermentability is temperature. To be on the safe side I mash 0.5 to 1 degree C lower in temp than I normally would, and haven't had problems yet. Batch Size - Its all gotta go in that bag, which you have to lift out, which has a finite strength before it breaks.... and you also have to fit everything in your kettle at once. So, much bigger than 5gallons and BIAB might not be the appropriate method. You can do it.. 10G batches have been made, but you definitely need a hook or pulley, and your pot has to be pretty big. Step Mashing - While you can add heat to your mash tun, because of the large volume its less like steps and more like ramps, long ramps. I've successfully done it.. but its a bit different and would take a bit of experience to get working well. Maybe no "Extreme" beers - As stated above, BIAB has the potential to be unkind to Beta Amalayse enzymes. If you are planning mashes at the extremes of the acceptable mashing temp ranges, or if you are using really significant amounts of adjunct that need to be converted. Then maybe BIAB wont do the trick. This hasn't been tested, but certainly it would be playing to the method's possible weaknesses. I think I have covered why I think BIAB is good. But I will re-iterate one point. This method is really attractive to new AG brewers. The consistent comment from new BIAB brewers in Australia is "without BIAB I would never have gotten into AG" Now, a few guys have caught the brewing bug, and moved onto traditional systems, but a lot of guys are happy with BIAB. I like to think of it as another step in the process. One that fits pretty well in between partial Mash extract brewing and standard AG. You can use it as a stepping stone if you want, or just take it as a perfectly legitimate AG brewing method in its own right. 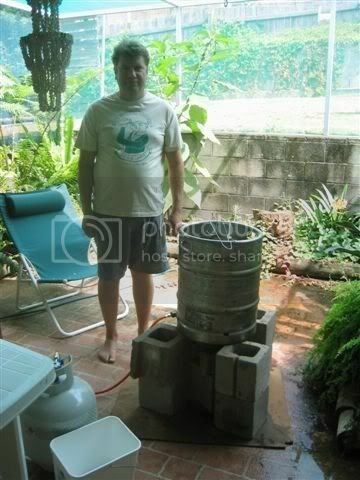 I have a traditional 3 vessel HERMS setup, but when I brew a half size experimental batch.... I brew it BIAB. I have 9.5litres of BIAB dry stout cold crashing now to drink on St Patty's day. Its 1.01 and tastes damn good out of the sample jar. OK. I need to go to bed now. Plus my fingers are sore form typing stupidly lengthy posts. Let rip with questions, comments and criticisms. I am convinced that this is such a valuable tool to attract new AG brewers that I am more than prepared to champion it vs all comers. Last edited by Thirsty Boy on Wed Aug 29, 2007 10:20 am, edited 2 times in total. Dude, that whole process rocks. I love it when someone takes "common knowledge" and actually tests it out. If you (or someone else) are worried about L:G ratio (and it sounds like there is no need) then perhaps you could tie up the bag a little tighter, or hold it partially lifted out of the kettle during the mash to reduce the effective volume of the bag. Kind of like a giant steeping bag. What kind of fires-from-hell 4 headed burner is that you have under there? 1st stage from an Atlas rocket or something? Man is this cool. I'm going to stick it to the top for a bit. 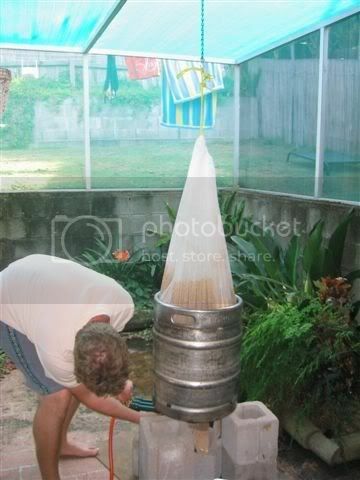 The only problem I can see with doing it here would be holding the mash temp in the winter. Even in my extreme cooler that I use for a mash tun and wrap with blankets I have a hard time holding mash temps in the winter. I guess you could always fire the burner half way through tho. I really like this. I may have to get the wife to sew me up one of those big bags and give it a try. I have actually been thinking about trying something like this myself for giggles, now I know some drunk convict thinks it works. For a beginner and one who isn't hip on process control (i.e. Justin) I don't see why this wouldn't be a perfectly acceptable way to brew. Though I don't see where you get 1.5-2.5 hours savings (over batch sparge), perhaps 20 minutes. bub wrote: Though I don't see where you get 1.5-2.5 hours savings (over batch sparge), perhaps 20 minutes. Cleaning is a biggie. Only have to clean one vessel. Iâ€™m impressed with the simplicity of the BIB method, As you pointed out this brewing style would make an excellent steeping stone for the new AG brewer, also would appeal to folks with limited storage for equipment. The one question I have is why not use a proper water to grain ratio for the mashing process and add top off water or better yet use hot tap water to sprinkle sparge the bag of grain. A man has ony 2 things in life his word and his balls or is that 3 things?? Beevo, "I burned my tongue." Nice. Where was this when I was making the jump? I soooo would have started with this method instead of making all of the other things. It would have been easier to get past SWMBO. I'm not a slacker in society. I'm an over achieving homeless person. Drunk posting should be reserved for The RAT PAD! !